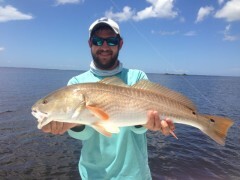 Sanibel and Fort Myers back country waters are producing good fishing for any time you can get out on the water. Personally as a fishing guide, I like the mornings or the late afternoons this time of year. Although you can catch fish anytime during the day. The only thing that’s a must is current. The tide must be moving. My charters begin with questioning what my client want out of the day on the water. It varies dramatically from one client to another. We have so many different species to target. 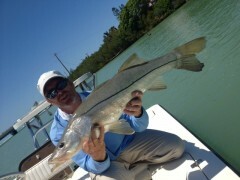 Some clients are specific on what they want, to catch a Snook, Tarpon, Redfish. While others just want to catch something and some just want to have a fun, safe day on the waters around the islands of Sanibel or Captiva. Go to a great waterfront restaurant for lunch. 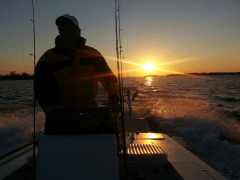 We offer more than fishing (I’m always saying “it’s more than just fishing, it’s an adventure”) as we see Dolphins and Manatees, lots of birds and some beautiful sunrises and sunsets. September and October is just around the corner and the fishing is usually some of the best of the year. Look at your calendar and give us a call to get your day booked before it’s too late.